A spooky celebration calls for eerie adornment. 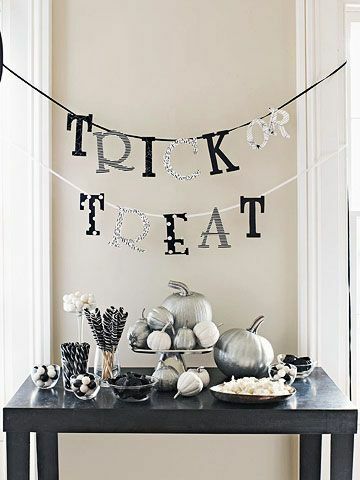 A festive banner hangs above a sideboard tableau mixing luminous pumpkins with bowls of gum balls, licorice wheels, saltwater taffy, and other devilishly delicious treats. Here's how: To make a sign template, choose a fun font from your computer (or mix several), enlarge (try 550 to 600 point size), print, and cut out. Peel backing from one side of double-side adhesive sheets and attach to card stock. Cut strips of black-and-white fabric and place on the reverse side of the adhesive sheets. Place a letter cutout on the fabric-covered card stock. Trace and cut out the letter. Repeat process for each letter. Glue small loops of velvet ribbon onto the back of each letter. Thread a long piece of velvet ribbon through the loops and hang above a table or doorway. For silver pumpkins, use several coats of metallic floral spray until completely covered. Assorted black and white candy, bulkcandystore.com; assorted fabrics, equilter.com; Therm O Web PeelnStick double-sided adhesive sheets, createforless.com, from $3; Fiskars micro-tip scissors, createforless.com, $10.50; Beacon 3-in-1 craft glue, beaconadhesives.com for info; Design Master matte-finish floral spray, dmcolor.com for info; Krylon satin-finish spray paint, krylon.com for info. The mood darkens at the sight of a somber wreath and an arrangement of ebony-painted plates and bowls. Here's how: For the wreath, remove stems from fabric flowers (dark colors work best). Glue the base of each onto a Styrofoam wreath form until it's densely covered with flowers. 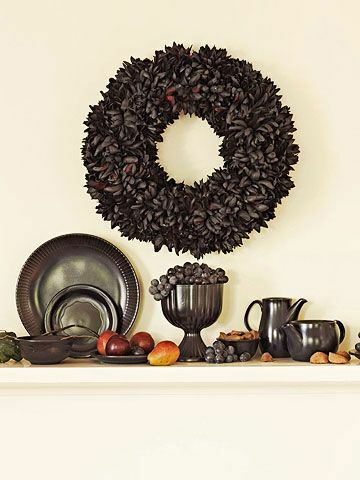 Using several light coats, spray the wreath with matte black floral spray paint. For the black dishes, spray-paint inexpensive thrift shop dishes with two coats of satin-finish black paint. Let dry thoroughly. Artificial flowers, Styrofoam wreath form, foam glue, all available at craft stores; Design Master matte-finish floral spray, dmcolor.com for info; Krylon satin-finish spray paint, krylon.com for info. 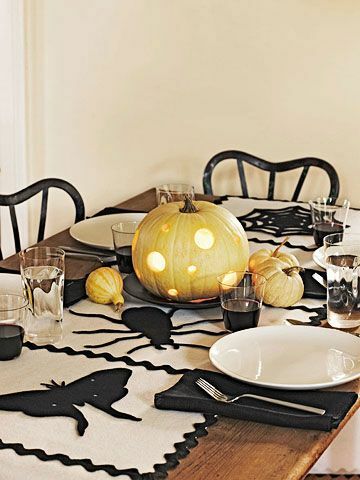 A table runner embellished with critters sets the scene for fright night entertaining. Here's how: Cut white felt to fit the table's length (add 12 inches for overhang on each side) and width (ours is 18 inches). Glue strips of rickrack in equally spaced sections and around the edge of the runner. Enlarge Halloween clip art (see slide 8 for resources), then print and cut out. Trace cutouts onto black felt, cut out, and glue onto the runner as desired. For the pumpkin, draw circles with a grease pencil, varying the pattern. Drill holes using different-size bits. Cut a 3-inch round in the bottom of the pumpkin for a votive. Tip: Use wool felt, not craft felt, for the runner because it's more durable and gives a crisp edge. Wool felt, weircrafts.com for info; black rickrack, doveoriginalstrims.com for info; Beacon Fabri-Tac glue, beaconadhesives.com for info; Fiskars micro-tip scissors, createforless.com, $10.50. 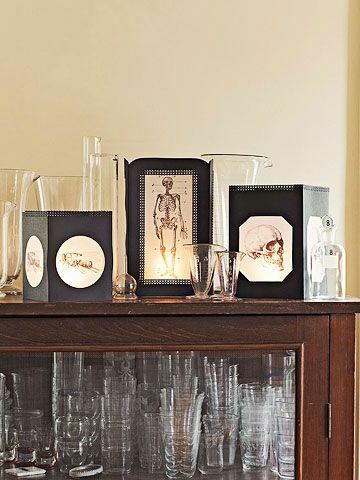 Paper lanterns featuring images of skeletons and skulls cast a bone-chilling glow on a mantel or table. Here's how: Enlarge clip art of skeletons (see slide 8 for resources), skulls, or bugs to desired size, and print onto vellum sheets. Cut four pieces of heavy black card stock to the desired height and cut "windows" in each piece of the card stock. Trim the vellum printout windows and tape to the back side of the card stock. Punch decorative holes into the top edge of the card stock, if desired. Fold card stock vertically, one fold on each side of the clip art image. Cut another piece of card stock to the same size as the folded piece. Tape it to the folded piece. Place a battery-operated light or votive candle inside each lantern. Tip: To make a fancy edge around the windows (see skeleton lantern), use an edge puncher on strips of card stock and attach around the edges of the vellum with glue. Inkjet-compatible vellum paper, dickblick.com, $13; EK Success Parisian decorative-edge punch, scrapbook.com, $13. 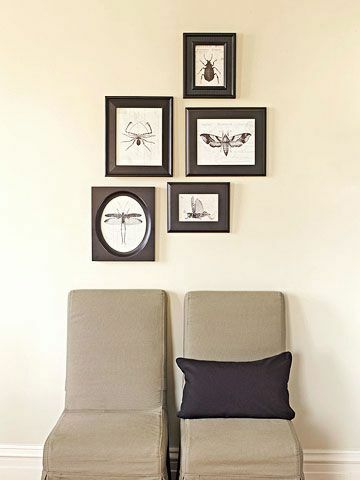 Insects in black frames send a menacing message yet are graphically refined enough to grace a wall after the party's over. Here's how: Download clip art (see slide 8 for resources) for the background (we looked for old postcards and medicine labels). Resize image to fit the frame, and print onto card stock. Download clip art of bugs. Resize as desired and print onto vellum sheets. Place the vellum sheets over the printed background and into black frames. Assorted black frames, Michaels stores; inkjet-compatible vellum paper, dickblick.com, $13. 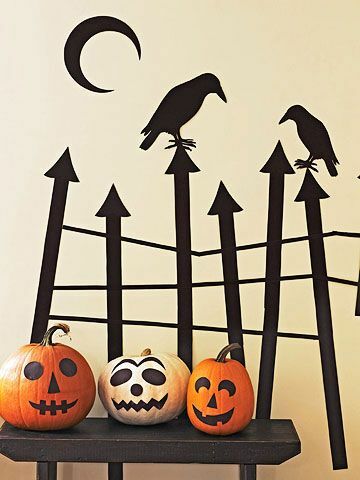 Dream up a haunted corner in your house with a rickety wrought-iron fence for goblins and spooky crows. Here's how: Enlarge clip art of crows and moon (or owls and bats) to the desired size. (See slide 8 for clip art resources.) Print and cut out. Position clip art on construction paper. Trace and cut out. To make the fence, cut long strips of black construction paper and an arrow shape for the tip of each post. For pumpkin faces, cut out eyes, mouth, nose, and eyebrows from black construction paper. Arrange the cutouts on the pumpkin to make a face and glue on. Tip: To avoid damaging your walls, attach silhouettes using removable double-side tape or temporary adhesive. Denril multimedia 14-x-17-inch vellum pad, dickblick.com, $18. Craft up a temporary costume for a plain lampshade. Here's how: Enlarge clip art of cobweb (see slide 8 for resources) to desired size, and print onto regular paper. Pick a lampshade (a straight-sided shade works better than a curved one) and trace the shape of one side onto a sheet of large multimedia vellum. Cut out the traced vellum lampshade shape. 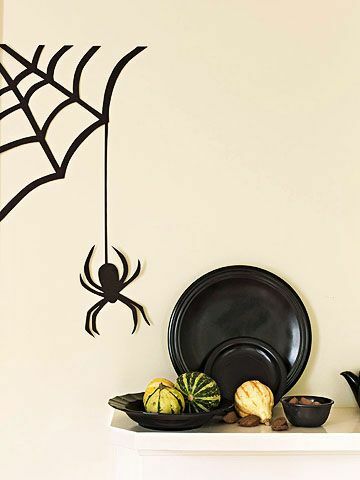 Place the vellum cutout over your printed clip art and trace over the cobweb with a permanent fine-tip black marker. Repeat process three times until you have four panels for each side of your lampshade. Attach the vellum panels to the shade, securing at the edges with black masking tape. Tip: When the season's over, carefully remove the vellum and tape to use lampshade as normal. 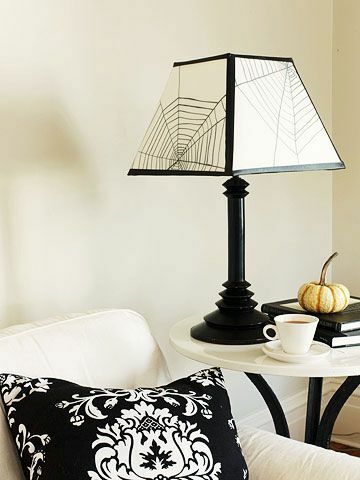 With its graphic silhouette, this is one cobweb you won't mind appearing on your walls. Here's how: Enlarge clip art of a spider and web to the desired size. Print and cut out. Position clip art on construction paper. Trace and cut out. Pacon Peacock heavyweight construction paper, createforless.com, $2/50 sheets; Fiskars micro-tip scissors, createforless.com, $10.50. Clipart Resources graphicsfairy.blogspot.com, thevintageworkshop.com, clipart.com, pdclipart.org, The Clip Art Book: A Compilation of More than 5,000 Illustrations and Designs (Gramercy), Old-Time Anatomical Illustrations CD-ROM and Book (Dover), Insects CD-ROM and Book (Dover). Originally published in the October 1, 2010, issue of Family Circle magazine. 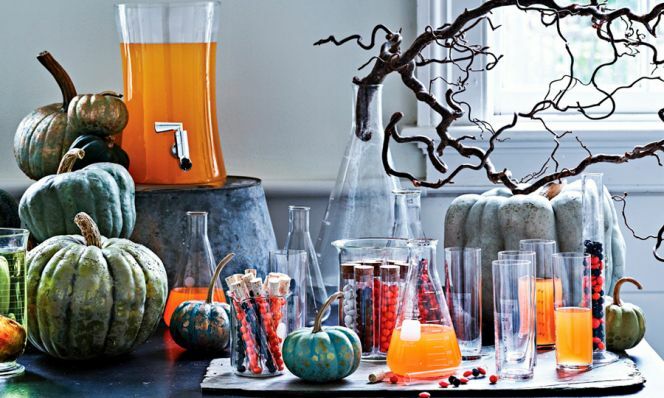 Bonus Halloween Pumpkin Decorating Ideas!